November 11, 2008 by admin, under Development Board News. 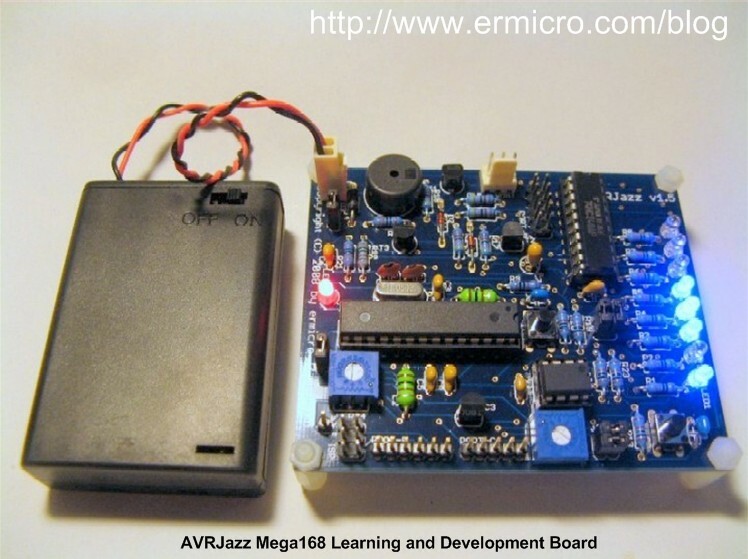 The AVRJazz Mega168 board from ermicro is designed to be used both as the AVR microcontroller learning and development board. The AVR Jazz Mega168 board is stand alone microcontroller module equipped with the latest Atmel high performance low power technology AVR ATMega168 or ATMega328 microcontroller that can be used for wide range of applications including embedded controller, remote data logger, robotics and much more. The AVRJazz Mega168 board microcontroller socket is pin compatible with Atmel 8-bit 28 pins microcontrollers such as ATMega44 (4K), ATMega8 (8K), ATMega88 (8K), ATMega168 (16K) and ATMega328 (32K). 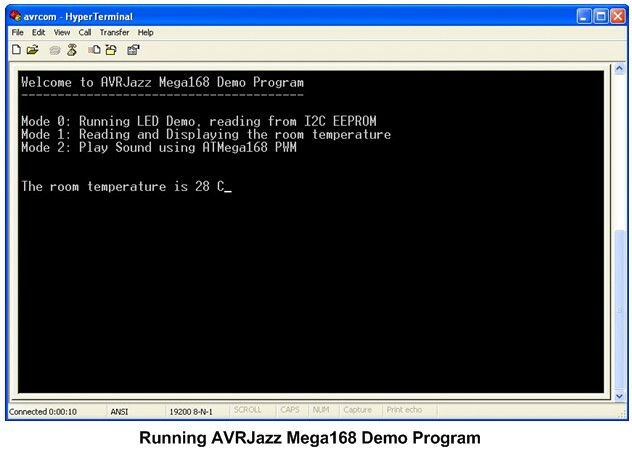 The AVRJazz Mega168 board demo program source code is include in the CDROM; this program demonstrate the capability of the AVRJazz Mega168 board such as accessing the I2C 24AA128 EEPROM, reading the LM35DZ centigrade temperature sensor, using the RS232 port, using the user switch, using the user analog input (trimport) and running the eight 3mm blue LED. 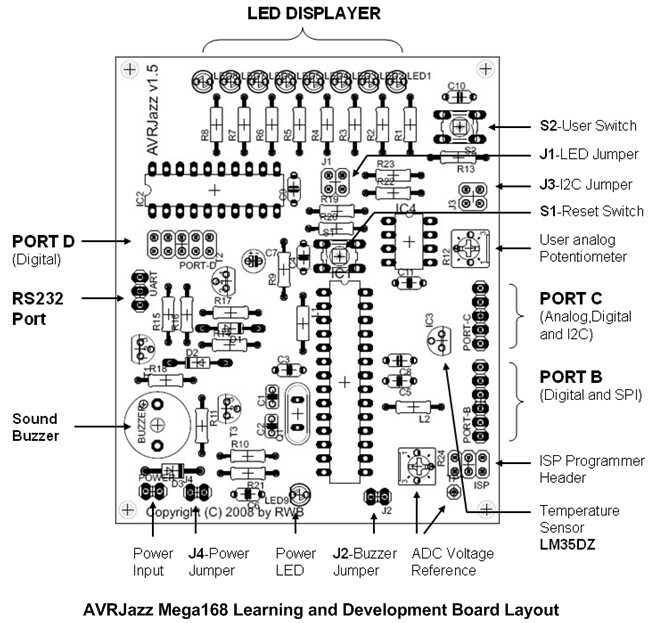 The AVRJazz Mega168 Board comes preprogrammed with a demonstration program. 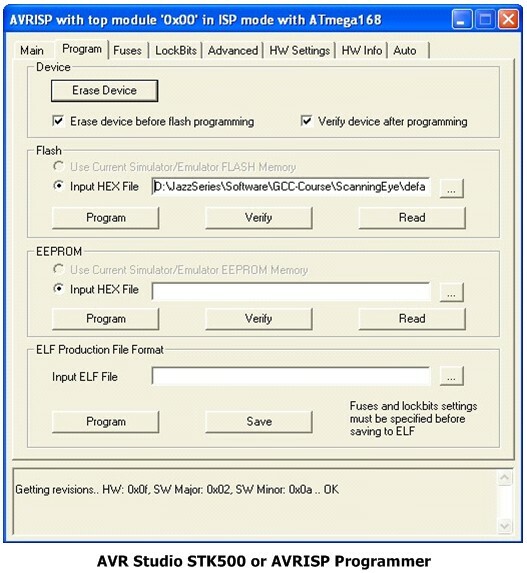 To use this program, connect the AVRJazz to the battery power that come with the board. The demo program will display the chasing light on the eight blue LED (mode 0). Rotate the user trimport, labeled R12, and the chasing led speed will change in different rate. Press the user switch, labeled S2, and now the board will display the room temperature through the RS232 port (mode 1), press the S2 switch again, the board will play a sound (mode 2) and automatically back to mode 0. The temperature could be monitor with Windows Hyperterminal or puTTY program on your computer. Connect the RS232 cable come with the board directly to your computer COM and start the Hyperterminal or puTTY using this following setting: 19200 baud rate, 8 bit Data, Parity: None and 1 Stop Bit. 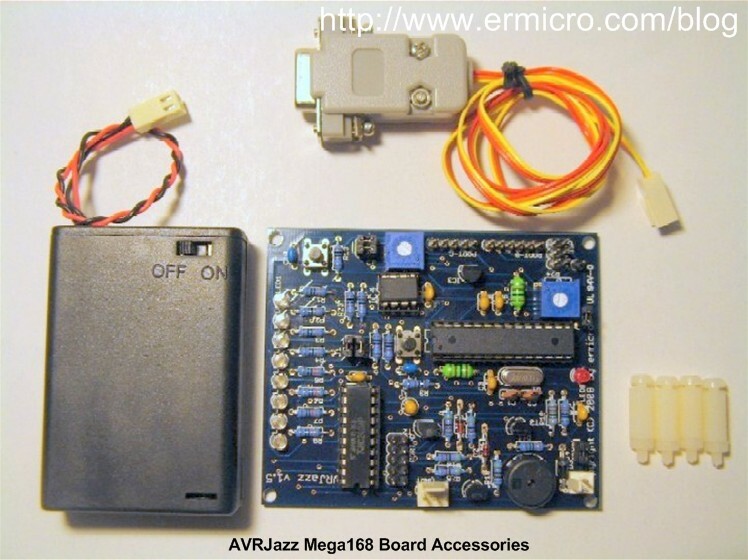 AVRJazz Mega168 board comes with the preprogrammed bootloader program that utilized the Atmel® ATMega168 microcontroller self programming feature; combined with the RS232 make it possible to reprogram the AVRJazz board without using any external hardware. The preprogrammed bootloader use the latest STK500 ver 2.0 protocol for faster and more efficient data downloading. The STK500 downloader which include in AVR Studio 4 is use as the PC front end to download the HEX data through RS232 interface connected to the AVRJazz Mega168 board. 2. Set the AVRJazz Mega168 board into the programming mode by pressing the Reset Button (S1) followed by the User Switch Button (S2) at the same time, two indicator LED will lid (active UART transmission) and the board is ready for accepting command through the RS232 port (If you don’t have RS232 port on your PC, you could use the USB to RS232 adapter). Make sure the device selected is atmega168 (atmega328P for the AVRJazz Mega328 board) and the frequency is set to 11059200 Hz. Leave the other setting to its default. 4. Press F7 or through Build -> Build menu, if no error occurs than you could simply continue download the HEX generated file (compiled file) to the board. 5. 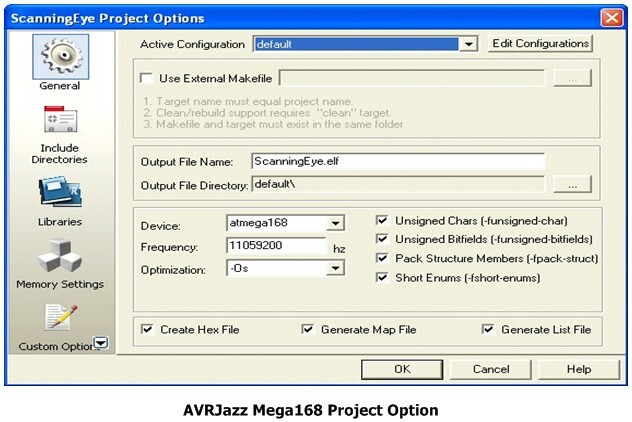 To download the HEX file to the AVRJazz Mega168 board, select Program AVR from Tools menu end choose the Connect… this will open the AVR programmer selection screen and Select the STK500 or AVRISP Platform and Auto for the Port then click the Connect button. 6. 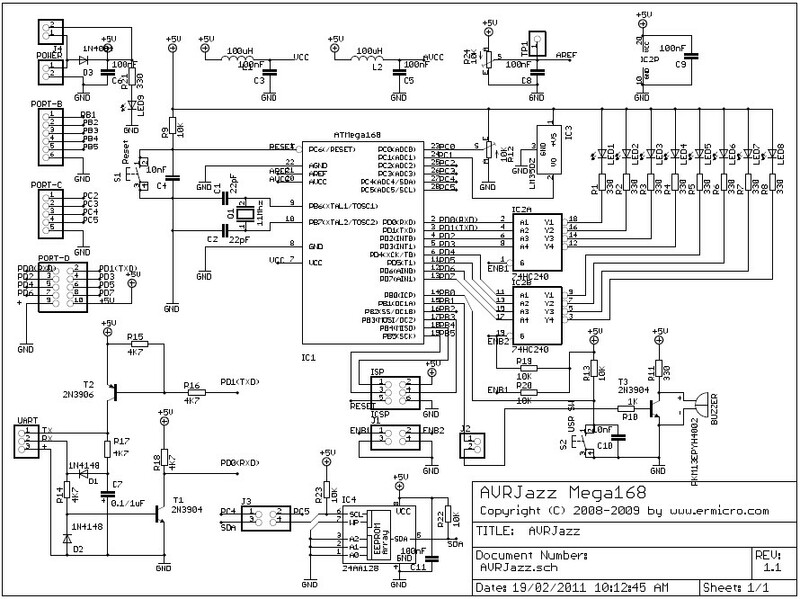 Close the AVR programmer program and press the reset button on the AVRJazz Mega168 board to run the loaded program. 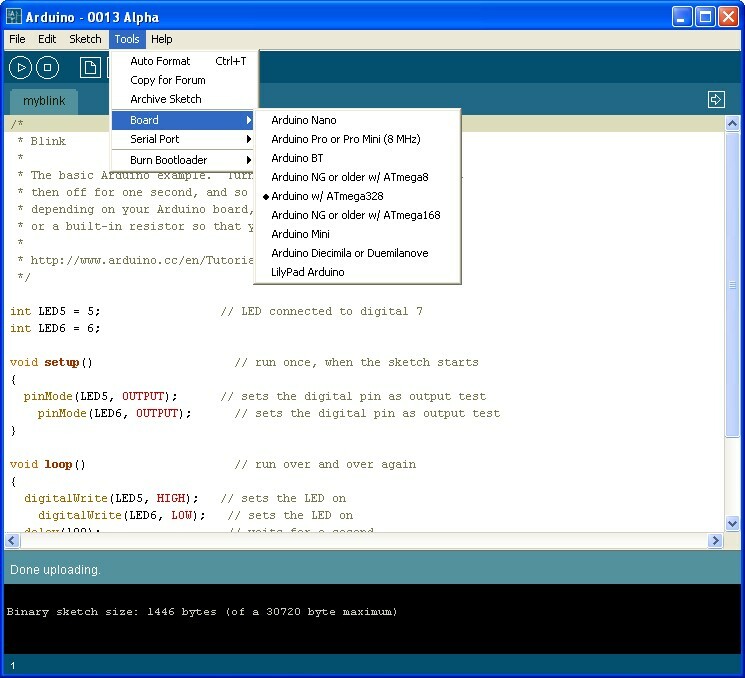 Now set the Arduino board by selecting from menu Tools -> Board -> Arduino NG or older w/ ATMega168 and then you could start compiling the Arduino blink program (menu Sketch -> Verlfy/Compile) and upload the code (File -> Upload to I/O Board) to the AVRJazz Mega168 board; the board should be in the programming mode to be able to receive the data from Arduino IDE. 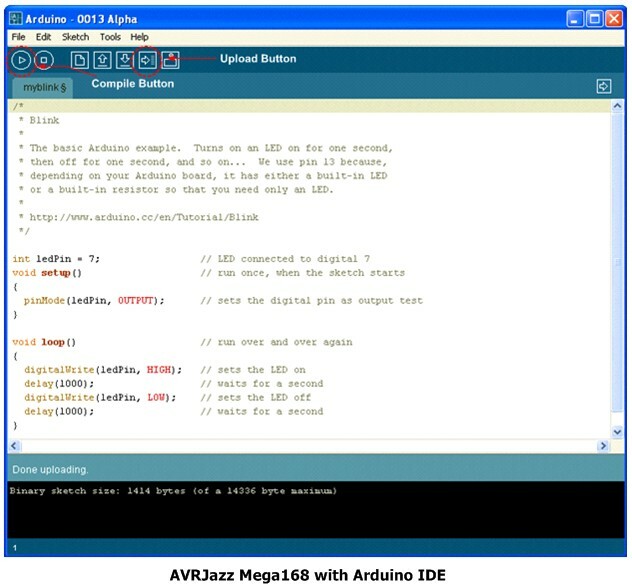 After upload the code, then press the reset button on the AVRJazz Mega168 board to run the new loaded program; now the LED connected to the ATMega168 PORTD PD7 (digital I/O 7 on Arduino environment) will blink continuously every 1 second. The AVRJazz board series also come with powerful Atmel AVR Mega328 Microcontroller which has the same features as the AVRJazz Mega168 microcontroller, only this microcontroller has twice the memory compare to the AVR Mega168 microcontroller. When uisng AVRJazz Mega328 with the Arduino environment make sure you choose the Arduino w/ATmega328 setting (Tools -> Board -> Ardino w/ATmega328). With twice the memory as the AVRJazz Mega168 board, the AVRJazz Mega328 learning and development board will give more room to enhance the board usage especially when we combine this board with enormous external devices supported by the AVR Mega328 microcontroller such as I2C (I squared C) and SPI devices. 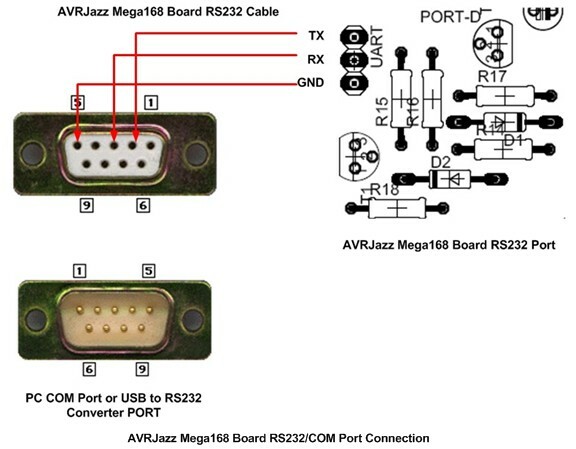 Get the AVRJazz Mega168/328 Board Now ! Your project is very cool. But I want to know how to configure the AVR fuses for AVRISP mkII programmer on Atmega168. Just choose the “Fuse” tab in the programmer (AVRISP mkII is ISP mode) and checked all the necessary ATmega168 fuse bit and press the “Program” button on that form. What is the part number or spec (ppm) for the 11MHz crystal? Where i can download the stk500 v2 bootloader for 11.0592Mhz crystal ? The AVRJazz Mega168/328 stk500v2 bootloader is programmed for AVRJazz board. 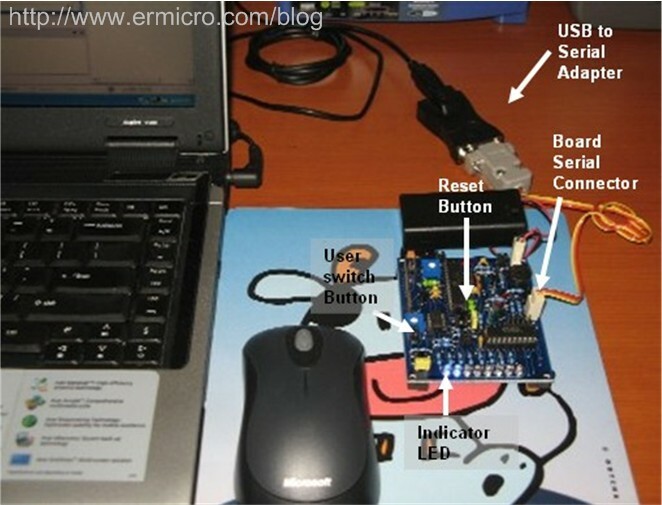 I suggest to use the Arduino bootloader as a starter for your own board. By the way, I’m interested in getting one AVRJAZZ ATMEGA168 Board. Do anyone of you guys know how much does it cost ?